Ephrata Plumbing was started in 1991 when Rick Froebe moved here from the coast. Since then, we have built customer relationships that lasted decades. Just read what our customers have to say about us on our testimonial page. 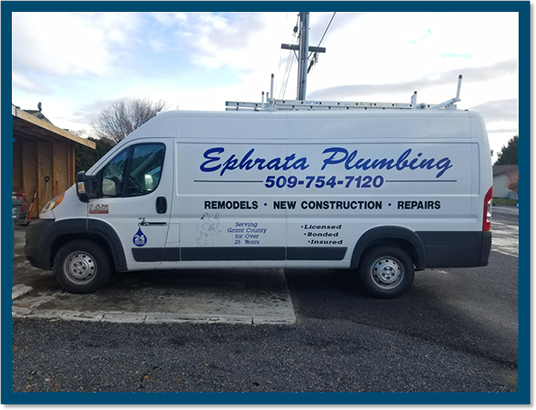 You can count on Ephrata Plumbing for all your plumbing needs. We have helped homeowners just like you deal with just about every plumbing issue possible. Our plumbers are available to help you and show up to your home or business in a stocked truck 24/7.
. . . Customer Comments . . . Thank you so much for coming to fix our sump pump on June 6th. It made the weekend with company much nicer! Thank you for working with us on this plumbing project. You guys are amazing! Thank You, Thank You, Thank You - - - Also thank you for the frequent customer discounts. Frank arrived when expected, was creative in solving some "old house" plumbing issues, fixed all three repairs so that they are working like new, and cleaned up the areas when done. I will definitely use Ephrata Plumbing for all future plumbing repairs.